Ida stamped her foot. Her friends were wrong. "I will not be a missionary to India like my parents!" she retorted. "Don't any of you say I will be, because I won't - never, ever, ever." Ida had never forgotten the faces of starving Indian children. She hated India - it was full of horrible situations she could do nothing about. 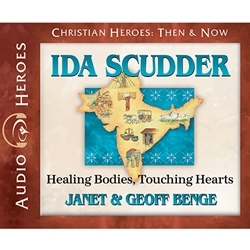 Ida Scudder was sure she would never follow in the footsteps of her medical missionary father. But when she witnessed Indian women dying because their religious beliefs didn't allow male doctors to treat them, Ida heard herself pray, "God, if You want me to, I will spend the rest of my life in India trying to help these women."